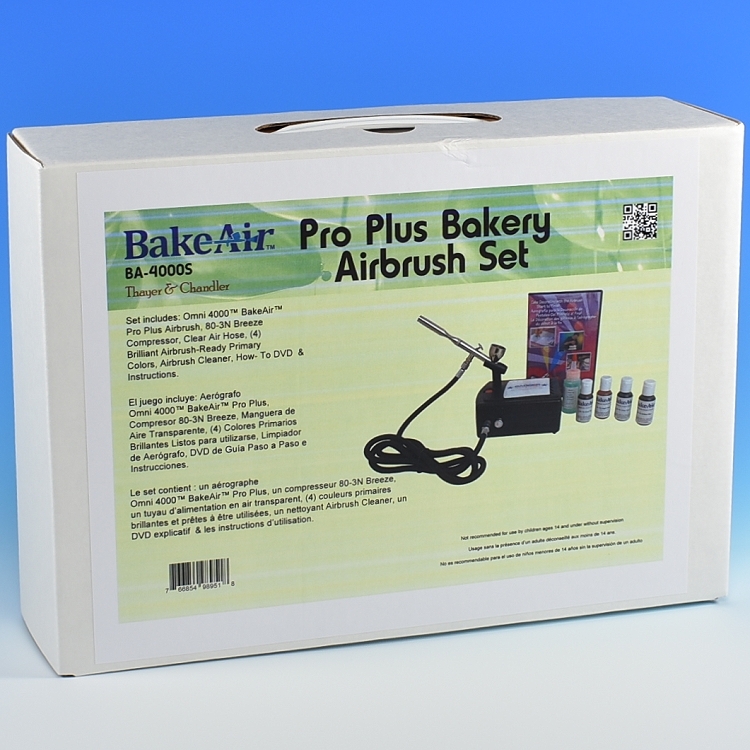 BakeAir Pro Plus Bakery Airbrush Set, by the Badger Air Brush Company. Ideal choice for a small bakery, this system will easily apply water-based airbrush colors finely and precisely. For water based airbrush colors and similar products. • Badger's Omni 4000 BakeAir Pro Plus professional airbrush offers precision performance designed for tight detail to broad spraying using a "One Tip-One Needle" combination. It is easy to clean and simple to operate. • Featuring a gravity feed cup, refers to top-mounted color cup in which gravity draws color into the airbrush. The long-standing choice of cake decorators and professional bakers! Correctly proportioned body weight provides perfect balance and comfort for the most exacting applications. This large 1/3 ounce permanently mounted color cup, lets you get close to your work and allows for easy cleaning and color changing. • Internal Mix - indicates that the air and liquid mix inside the airbrush, producing a thoroughly atomized "fine dot" spray pattern. • Dual Action - refers to the trigger mechanism which controls both air and color. • Compressor is perfect for occasional usage and is compact and efficient. This is a great choice for bakery use, cosmetic applications, low volume hobby and art projects. • Portable and light. This compressor operates with a DC 12V motor and produces a working pressure of 24 PSI. 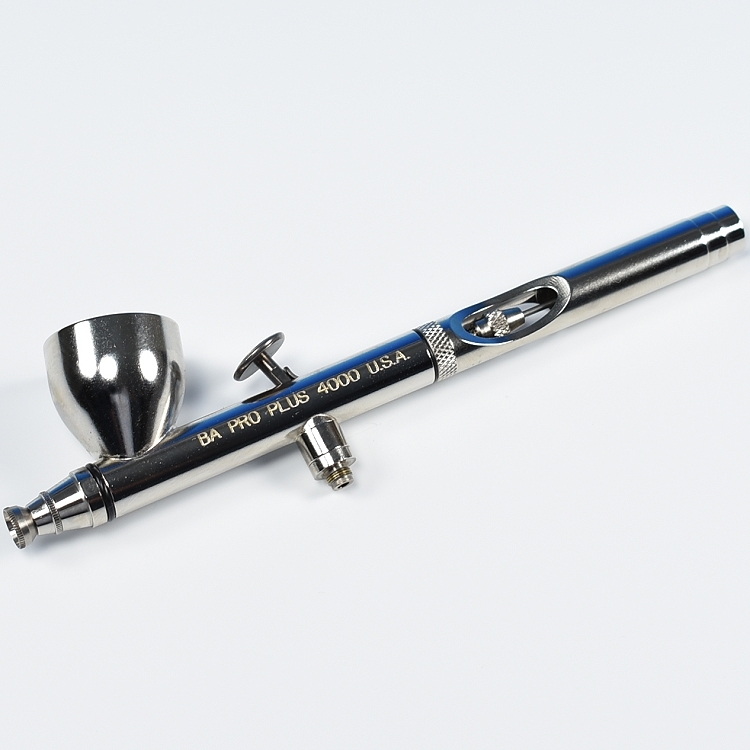 • Air Brush Holder, convenient holder eliminates the possibility of dropping the airbrush. • One year warranty. CE certification. • Flexible braided air hose. • Threaded fittings on the airbrush with a quick connection fitting on the compressor. > Instructional DVD: "Cake Decorating with the Airbrush"
• Tips, tricks and techniques for spraying and blending colors and creating special effects. 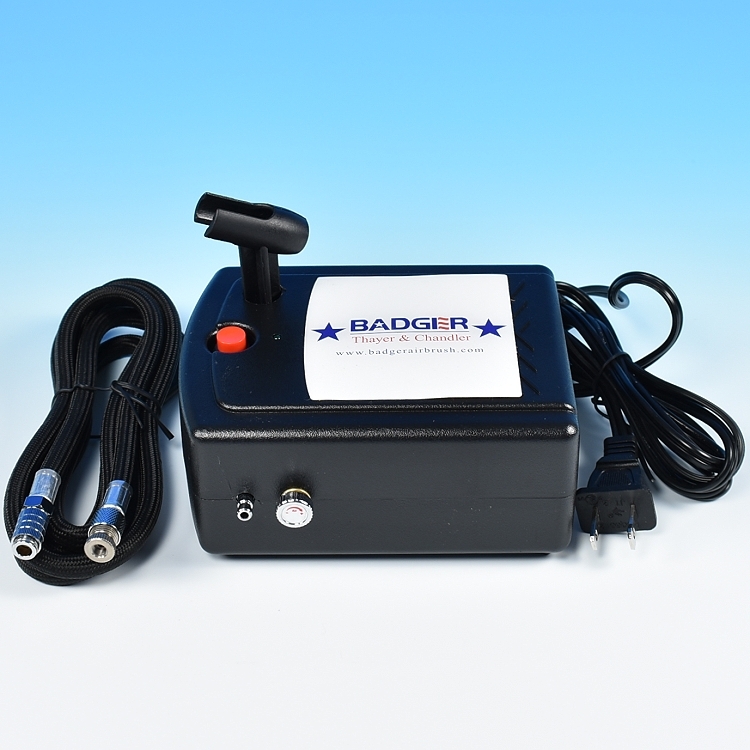 Badger Air-Brush Co. the leading manufacturer of airbrushes in the world ! For 40 years building components of the finest quality and exacting standards. 1 year warranty on airbrush components.